During the upcoming Russia-ASEAN Summit (May 19-20) to be held in Sochi, Russia, additional talks will be held with Southeast Asian nations seeking to bolster ties with Russia, who has until recently played a disproportionately minor role in Asia relative to the United States. It should be understood that Western special interests seeking global hegemony are driven first and foremost by economic ambitions. Political and military operations augment and run parallel to attempts to expand and dominate nations and regions of the planet economically. Such ambitions are meticulously planned out by policy think-tanks underwritten by corporate-financier interests, and sold to the public by corporate-dominated media campaigns. In other words, the realm of economics is simply another dimension these special interests wage their war of hegemony within. Therefore, for smaller nations like Southeast Asia’s Thailand, operating in contradiction to US interests both in the region and within Thailand itself incurs predictable punitive measures from Wall Street and Washington – including coordinated media campaigns to undermine the nation politically, US-funded nongovernmental organizations (NGOs) undermining the nation socially, and various forms of economic warfare to target the nation financially. Over-dependence on economic ties with the West are easily used as leverage over what should otherwise be a sovereign, independent nation. In addition to expanding economic independence and self-sufficiency within a nation, also critical for national security is to cultivate numerous foreign trade partners – particularly those who are diametrically opposed to one another geopolitically. This ensures that at any given time, at least half of one nation’s trade partners are eager to expand ties even if the other half is extorting existing ties to demand sovereignty-crushing concessions. For Thailand today, under considerable pressure from the United States and Washington’s campaign to undermine and overthrow the current government in favor of long-time US proxy Thaksin Shinawatra, diversifying foreign trade partners is more important than ever. 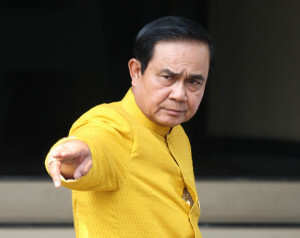 Thailand aims to set a target of a five times increase in bilateral trade within five years during Prime Minister Prayut Chan-o-cha’s visit to the country this week, according to Commerce Minister Apiradi Tantraporn. The four-day visit starts today. Apiradi said Thailand would participate in a special session of the Asean-Russia Summit, while a bilateral discussion would take place between Prayut and Russian President Vladimir Putin and Russian Prime Minister Dmitry Medvedev. [Prime Minister] Prayut will lead more than 30 major private enterprises in meeting with some 100 Russian private enterprises tomorrow at the Thai-Russian Business Dialogue. They aim to convince Russian companies to invest in Thailand, said Hiranya Sujinai, secretary-general of the Board of Investment. The Thai private enterprises cover sectors such as food, rubber, electronics and finance. “Russia has high potential in scientific and technological advancement and innovation. We want to invite Russia’s business groups to invest more in Thailand,” Hiranya said. Indeed, Russia and Thailand have mutual interests and tangible economic resources and expertise to exchange, while the United States offers only to integrate Thailand into its legal structures while allowing itself to buy out Thai infrastructure, resources, and markets. In particular, Thailand is seeking new markets for agricultural products. The United States has attempted to cripple Thailand economically, using “human rights” as a pretext to ban Thai agricultural imports to both the US and EU. Russia on the other hand, has no history of including political pretexts in economic deals. Russia, conversely, requires new trading partners to circumvent its own over-dependence on Western partners. A similar scenario has played out across Thailand’s tourism industry. In the aftermath of the 2014 military coup which ousted US-proxy Thaksin Shinawatra and his nepotist appointed sister, Yingluck Shinawatra from power, the US and Europe conducted a concerted public relations campaign to destroy Thailand’s tourism industry. Attempts to cripple numbers of American and Western European tourists arriving in the Kingdom were easily replaced, then eclipsed by an influx of Chinese tourists. Likewise, Russian tourists have been arriving in increased numbers in Thailand. Today, it is not uncommon to see signs written for tourists in Chinese and Russian when years ago such signs would have been in English and Japanese. The possibility of replacing enough economic dependency on the West with new ties between Thailand and Russia – along with other partners – could do for the rest of the economy what Chinese and Russian tourists have done for the tourism industry. Russia’s technological expertise, particularly in information technology, could also be particularly useful for Thailand, who is increasingly aware of the importance of media and IT in relation to national security. The talks this month will provide clearer insight into just how successful and extensive Thailand’s ability to diversify its economic ties will be. It will also be an indicator of how well Russia is able to strengthen its ties across the rest of Asia. More over, if successful, it will provide a clear cut alternative to the coercive means by which the US is “pivoting” toward Asia, and could help fend off an era of US-induced conflict and and regression in a region currently on the rise.